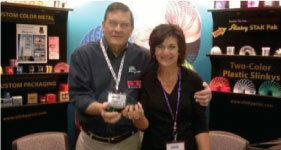 At a recent promotional products tradeshow, I was honored to have met Tom James, the son of the Slinky creators, Richard and Betty James. Having owned several Slinkys as a child, and have watched my own children having fun with the toy, I was immediately attracted to the Slinky booth at a show. Everyone knows what they are (94% Americans actually). We have all tried to walk them down stairs and put the Slinky in other daring situations. My children even brought their Slinky on vacation to Washington DC, knowing there would be opportunity for the Slinky to experience bouncing down steps at historic monumental buildings. In 1943, Richard James was a naval engineer working with tension springs in an instrument development process. One of the springs fell to ground and Richard watched it bounce across the floor. He brought the spring and an idea of a ‘walking’ toy home to show his wife, Betty. After research, it was Betty who later named the toy. Further development of the spring toy led to a Christmas launch at Gimbels department store in 1945. The store allowed demonstration space and the couple sold 400 Slinkys during their first day. Several years later, due to Richard’s leaving the country and their marital split, Betty alone, would not only save the struggling company but also expanded the toy line to include neon-colored toys, Slinky Jr., and Slinky Dog. Today, more than 300 million Slinkys have been sold, according to company history. The toy brings back memories for us all, and the idea of putting one’s own logo on it, is genius! The Slinky makes a great marketing product. Promote your company name on one of the most recognizable brands in America. Today, the Slinkys are still made in the USA!!! 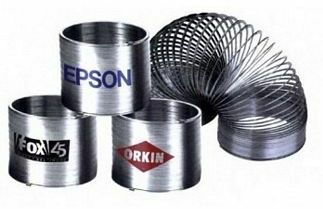 The Slinky is available in varying colors in metal or plastic and is imprintable in standard or PMS matching inks. This gift is a keeper – ‘expand’ your own branding and have Printsations get your logo on the Slinky!